Safeway had a sale on frozen crab legs last week and I thought I would make a crab something. Jan was not feeling like crab at the time so I left them frozen. 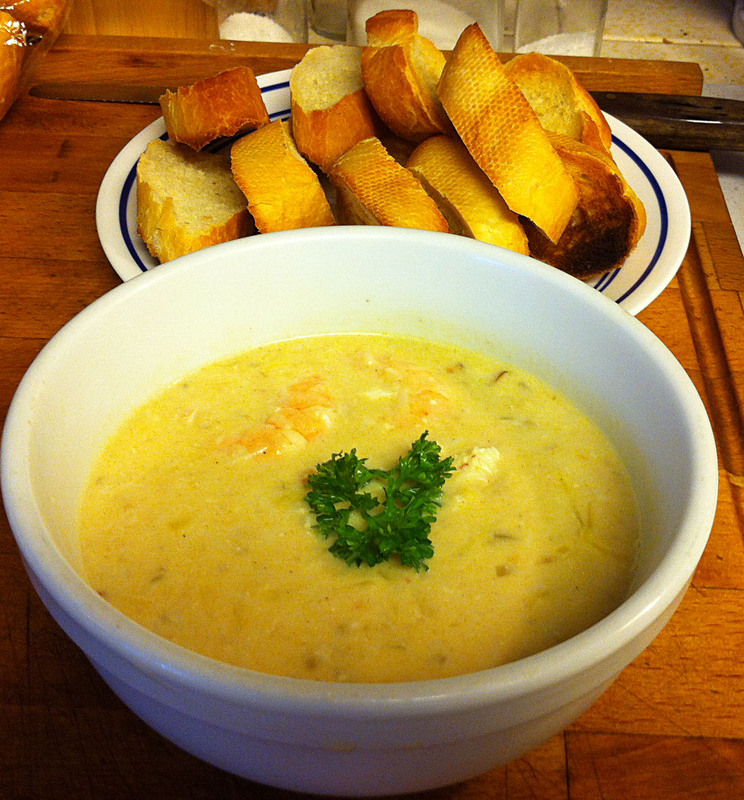 I remembered that I had them and I thought I would make seafood bisque today. I found that most of the recipes on-line did not suit me. I discovered that I have a strong bias as to what should be called a bisque. A bisque should be creamy and fairly smooth. The only discreet chunks should be seafood. If the recipe has a lot of chunky vegetables or starches it should be called a chowder, not a bisque. I finally found one that was close to what I had in mind. I have made seafood bisque before. No matter how much seafood I would put into it, the flavor always seemed a bit washed out. The Jamuary/Febuary issue of Cooks Illustrated had an article on this problem in the making a good Shrimp Fra Diavolo. The test cook had tried several liquids to make the stock for this dish, but everything seemed to wash out or cover up the shrimp flavor. They finally tried making a stock with the shells and that boosted the flavor substantially. I decided that a variation of that technique would also work for my seafood bisque. Once I had cleaned my crab and shrimp, I browned the shells in butter and then boiled them in a limited amount of water. Once the shells had boiled for ten minutes, I strained the broth well and used it for the majority of my soup stock. This greatly enhanced the final flavor of the soup. In cleaning my shrimp, I used to slice through the back of the shrimp to remove the dark vein that is the shrimp’s gut. This technique left an unsightly, “gutted” shrimp, as well as, the risk of a slipping knife “gutting” a finger. There is a better way. Take a pair of kitchen tweezers—these are just ordinary tweezers that you only use in the kitchen and not on your toes—and reach into the neck of the beheaded shrimp. The little black spot is the end of the gut—you may need to dig just a bit to find it. Grab the spot with the tweezers and gently pull strait out. The gut will slide right out. No gut and no damage to the shrimp. After Dinner Note: Jan declared this the best seafood bisque she had ever had and that she would be happy to pay $30 in a restaurant for a bowl of it. Jan is really not usually so effusive in her praise. 1. Clean and refrigerate the crab and shrimp, reserve the shells. 2. Melt one tablespoon of butter in a medium pot over a medium high heat. Add the shells and brown them lightly, about four to six minutes. 3. Add two and a half cups of water (you may also use a dry white wine) to the shells and bring the pot to a boil. Reduce the heat, cover the pot and simmer for ten minutes. Tip: As you are boiling the stock about half a cup will evaporate away. You want about two cups of stock when you are done. Note: Stir the pot occasionally as some of the shells may not be submerges in the liquid. If you using this as a main dish and are feeding more than four people, add another cup of liquid to the pot before boiling. 4. Strain the shells from the stock and reserve. 5. Clean the pot and add the rest of the butter. 6. Over a medium high heat, sauté the shallots until translucent, about three minutes. 7. Add the carrots and celery. Continue sautéing for 4 more minutes. Tip: I chose to use a yellow heirloom carrot so that it would not turn the soup bright orange. I personally think that bisque should be on the lighter side of the color spectrum. This is a personal choice of mine; you are free to make your own choices. 8. Pull the vegetables to the side of the pot and add the garlic to the hole in the center. Stir fry the garlic of one minute, until fragrant, and then mix it into the rest of the vegetables. 9. Mix the flour into the vegetables and continue sautéing for three to four minutes. Tip: You are creating a roux with the vegetables, butter and flour. You want to cook the mixture long enough that the butter binds with the flour, the flour loses its raw taste, and the vegetables are starting to break down into a paste. The mixture will tend to stick to the bottom of the pot. Some browning of the vegetables is good, that is the Maillard reaction making complex flavor compounds. However, you do not want the mix to scorch, so make sure to stir and scrape the pot frequently. Don’t be gentle. 10. Add the fresh tomato and the tomato paste and continue cooking for two more minutes. 11. Add the reserved stock, anchovy paste, salt and pepper. Bring to a boil, cover the pot, and reduce the heat. Simmer for ten minutes. 12. Add the raw shrimp and continue simmering for two minutes. 13. Stir in the crab and cream and bring the soup up to serving temperature. Stir occasionally so that it heats evenly. Tip: This can take several minutes over a medium low heat. You want the soup warm enough to eat, but not so hot that the cream starts to boil. 14. Transfer the bisque to a tureen or individual serving bowls and garnish with sprigs of parsley. Serve with toasted French bread on the side and salad—I used some coleslaw left over from yesterday. Tip: Jan likes to rip the bread into croutons to add to the soup, while I like to butter the toast and take a bit of each.